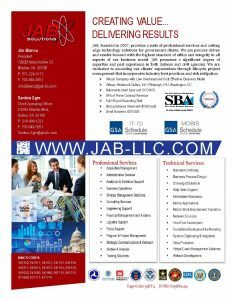 Technical Services: JAB provides professional and managed services specializing in designing, building, implementing, supporting, and securing high-availability environments and data communication networks (wired and wireless). Network Infrastructure: JAB provides a turnkey solution for structured cabling plant through industry-compliant designs, implementation and support for network infrastructure, telephony and communications cabling. Global Services: JAB delivers comprehensive services solutions for technology rollout deployment, product integration, logistics management, field maintenance and equipment installation on a national and inter-national basis. Converged Technologies: Jab specializes in design, installation and support for technologies that are Internet Protocol (IP) based services, and competing for network bandwidth.